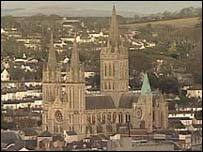 Truro Cathedral is launching an appeal to raise £150,000 over the next three years for its choir. The project, called Truro Cathedral Music, is aimed at improving the choir's standing in the community and the wider musical world. The organist and musical director at the cathedral, Robert Sharpe, said the choir was exceptionally talented. It currently sings at six services in the cathedral each week, and performs at other Cornish churches. The choir, which is made up of 18 boy choristers and 12 adult singers, also goes on overseas tours. Mr Sharpe saif the choir was one of the top five in the country, and the money would help it to flourish in the future. Truro Cathedral Music will allow people to join a membership scheme with newsletters, and offer priority booking for concerts and members-only events.